Do you have a constant stash of empty cardboard tubes laying around the house like I do? They are one of those essential craft supplies that I like to keep on hand but every few months I make myself have a heart to heart with them and say “Ok, you either have to part with these in the recycling bin or you need to get crafty with them.” Don’t fear because this month instead of parting with them you can turn them into this darling cardboard tube ladybug craft. 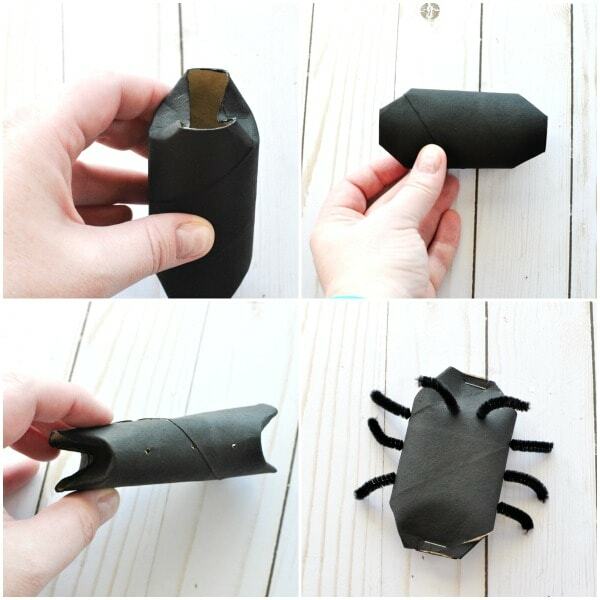 Best of all, they are a perfect match to our cardboard tube bees, so you can have an afternoon of fun making cardboard tube insects. 1. Gather your supplies. Paint the outside of your cardboard tube roll with your black paint. We used a cardboard toilet roll but you could also cut down a paper towel cardboard tube. 2. 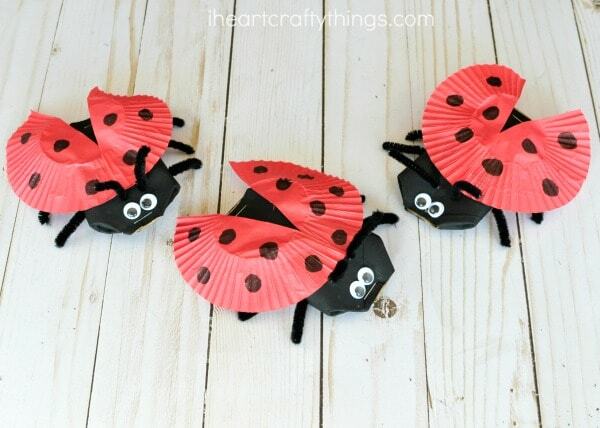 When your cardboard roll is finished drying fold down two sides on both ends to form the ladybug body (see pictures below). 3. 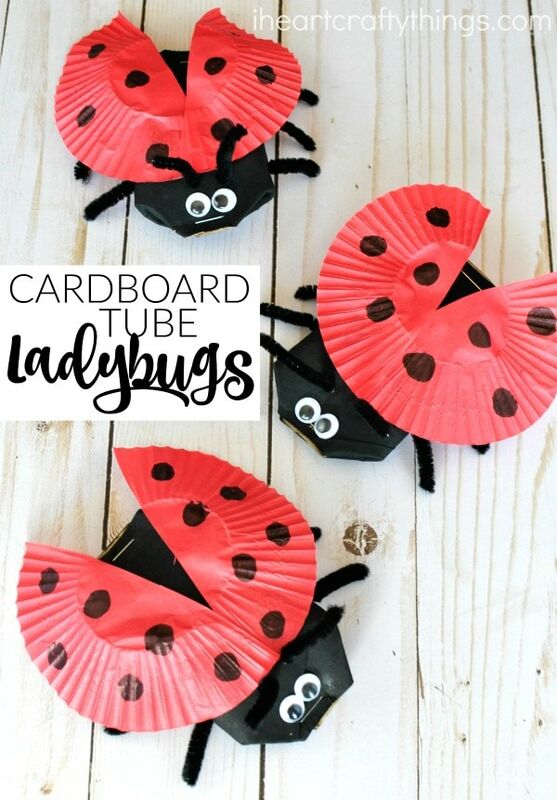 Use a small screw driver or something pointy to poke three holes on each side of the cardboard roll for the ladybug legs and two holes on the top of the cardboard roll, near the front, for the ladybug antennae. 4. Cut two pipe cleaners into quarters. Staple the top and bottom of the cardboard roll closed. Then poke the pipe cleaner pieces into all of the holes around the cardboard roll for the ladybug legs and antennae. 5. 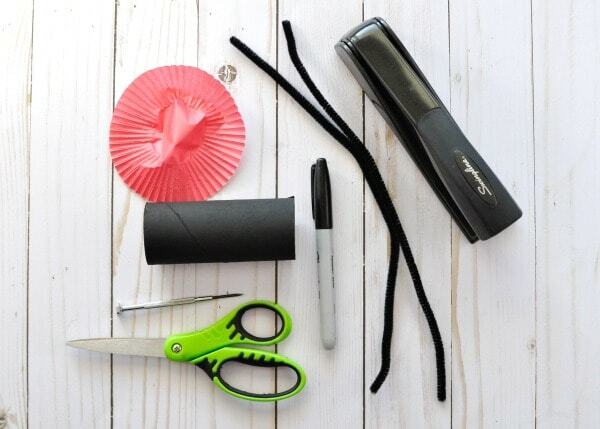 Flatten out your red cupcake liner and cut it in half. 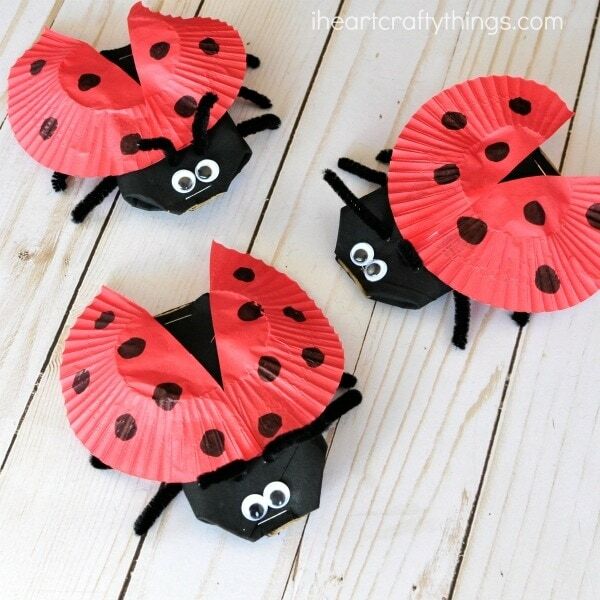 Use your black marker to color spots all over the ladybug wings. Glue the wings onto the ladybug behind the antennae. 6. 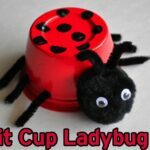 Finish your cardboard tube ladybug craft by gluing googly eyes onto the front of the ladybug. Looking for more insect fun? 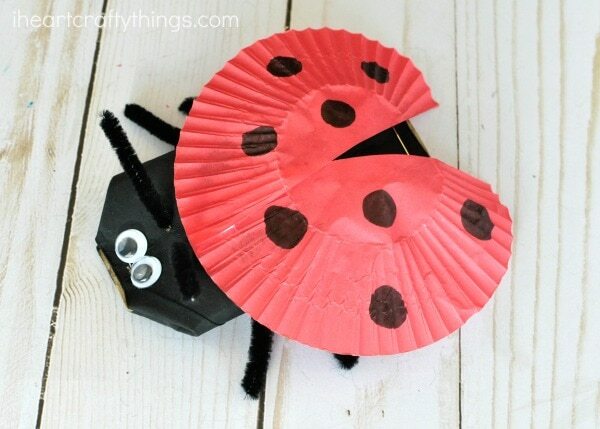 Here’s a fun way to turn a paper bowl into a cute ladybug craft. Or you might also love these shimmery dragonflies. These adorable egg carton baby bees over at my friend’s website are sure to be a hit too! I hope you have a wonderful weekend! Thanks for the cardboard tube inspiration!! 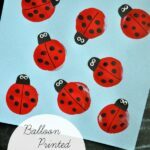 I have been looking for something to do with smaller kids, how very cute are these ladybirds! 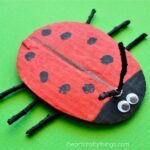 These are so fun to share and create with my granddaughter, thank you for sharing! !